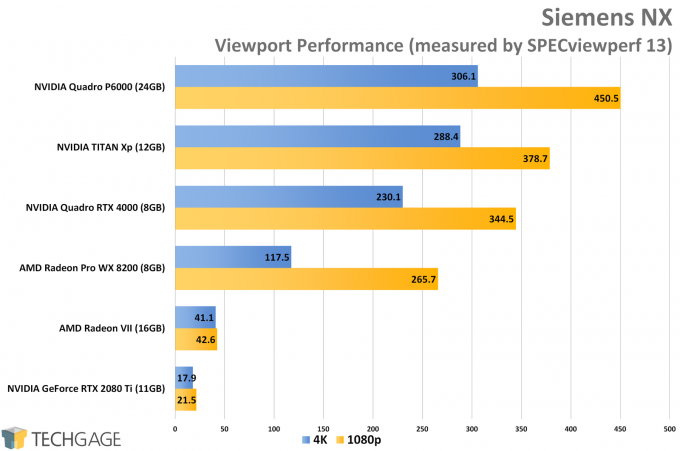 AMD’s Radeon VII might be the first 7nm gaming GPU, but the reality is, this Vega 20 chip is keen on tackling compute-intensive benchmarks, such as those from our workstation test suite. 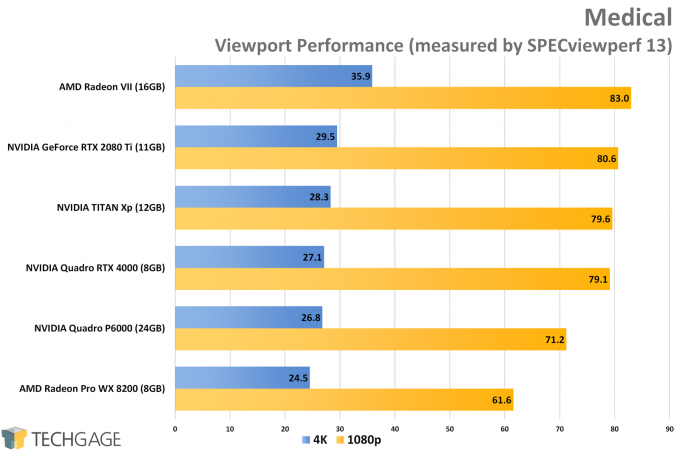 Having taken a look at gaming performance in another article, this one takes care of encoding, viewport, and rendering applications. Based on the fact that the Quadro P6000 pushed ahead of the faster-clocked-but-equally-spec’d TITAN Xp, it seems like Quadro might have some optimizations in place that helps boost performance. 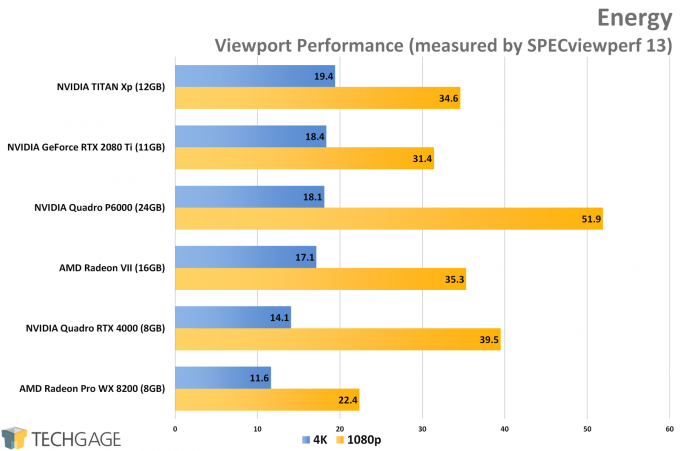 At the same time, architectural enhancements brought to the 2080 Ti help it keep comfortably on top of this chart. 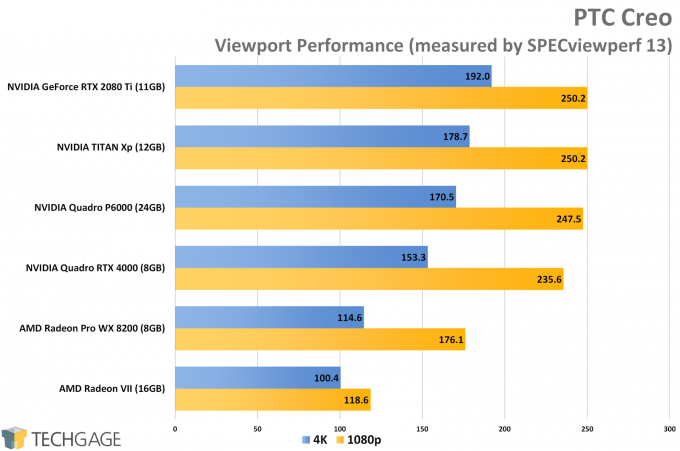 Unfortunately, the Radeon VII didn’t perform well here against the competition, even having been beat out by the Quadro RTX 4000. That card costs about $300 more than the VII, but is technically slower (it’s a pro card, thus it costs more). 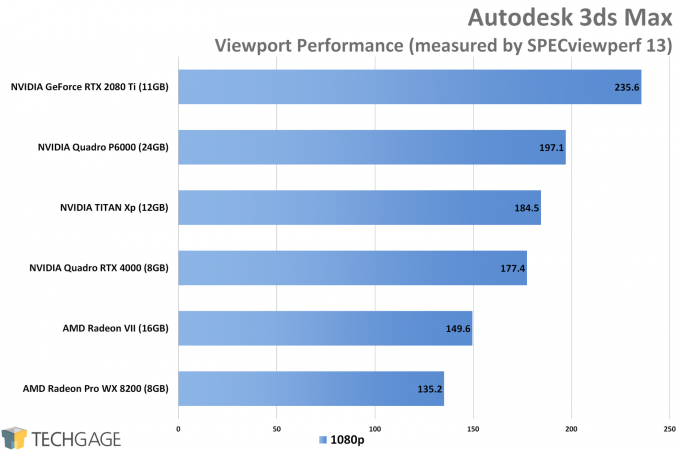 SPEC’s 3ds Max viewport test is the only one of this bunch limited to 1080p resolution, and fortunately, we begin to see the VII exercising its strengths a bit better here with Maya. At 4K, the card comes ahead of the RTX 4000. 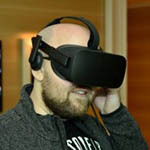 At 1080p, the performance oddly suffers, a reality that probably won’t be evident based on the performance being extremely good at that point to begin with. With the CATIA test, Radeon VII has its chance to shine, placing well ahead of the 2080 Ti. Somehow, RTX’s enhancements haven’t benefited this test as much as it has some others, much to the VII’s benefit. CATIA is one such example of software that would justify 16GB of GPU memory. These results also highlight that CATIA is an area where NVIDIA chooses to deliver optimizations to the TITAN Xp (and possibly other TITANs). The Quadro P6000, despite being technically slower than the TITAN Xp and 2080 Ti, tops the chart. The RTX 2070-esque Quadro RTX 4000 likewise places well ahead of the RTX 2080 Ti. This review is going live a week before SOLIDWORKS World 2019, held in Dallas, Texas, so it’s too bad we didn’t have some great news about VII performance to share. Fortunately, the VII isn’t alone in suffering crippled performance here. The 2080 Ti and TITAN Xp are also held back. 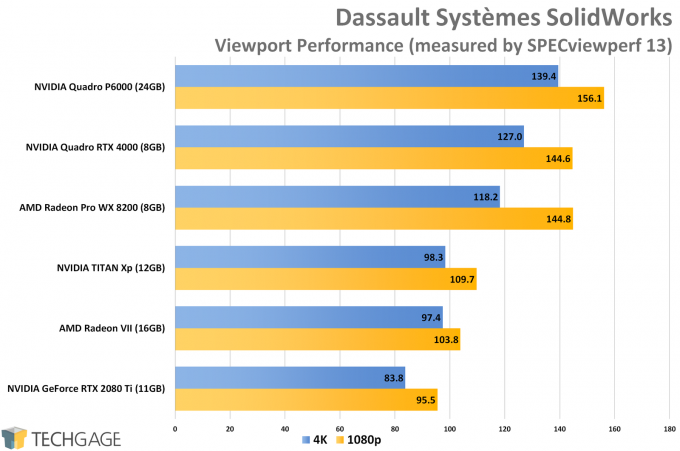 Meanwhile the Radeon Pro WX 8200 and both Quadros occupy the top-half of the chart. Siemens NX helps prove that not all workloads are built alike. The TITAN Xp, which didn’t fare as well as the Quadro P6000 in SolidWorks, had no problem delivering explosive performance here. It didn’t quite match the P6000, but the real-world benefits at that point are going to be harder to distinguish. That’s not so much the case when we’re looking at the gaming cards. With those, you’re definitely going to notice a serious performance hit. Radeon Pro and Quadro are your go-to here. We sometimes bundle Energy and Medical together, but Radeon VII makes things too interesting to do that this time around. In the Medical test, the VII outperforms all of the others, and if you’re suspecting that the 16GB of VRAM helped, you’re probably correct. 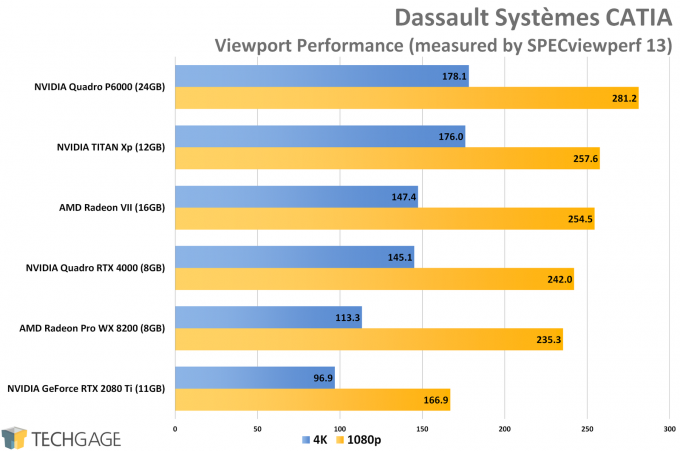 With this Energy test, 1080p and 4K performance deltas can vary to a much greater degree than most of the other tests here. At 1080p, the Quadro P6000 sits far ahead of the pack – a result that seems unrealistic, but matches our testing from the last time we put the card through its paces. 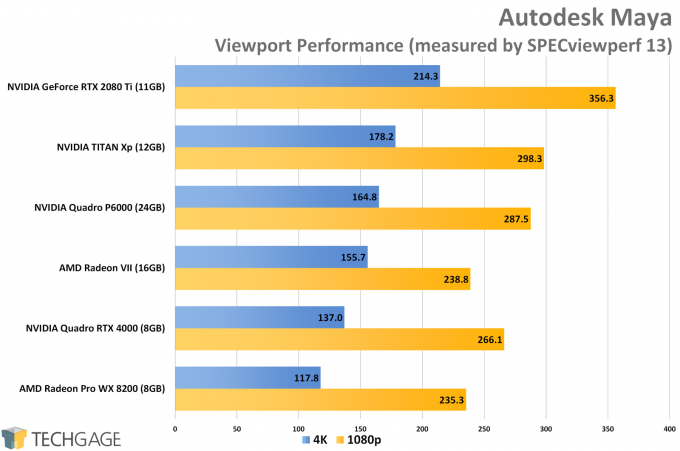 At 4K though, the differences in performance between the GPUs is harder to distinguish – a good thing for users.